Enjoy mushroom time in Mendocino County or another wind-down getaway at the pretty coastal charmer. Need some gorgeous coastal views, some bundle-up weather, and that Mendo magic? Peruse five fantastic specials at this ocean-fronting charmer. THERE'S TRAVELING TO A PLACE, to stay there, and there's checking in, and there's journeying, and there's entering a location. But when "tucking in" is involved, there's something far cozier afoot. It's probably cooler, and it could be autumn, and there's likely a sense of snuggling-down and sweatering-up afoot, as well. 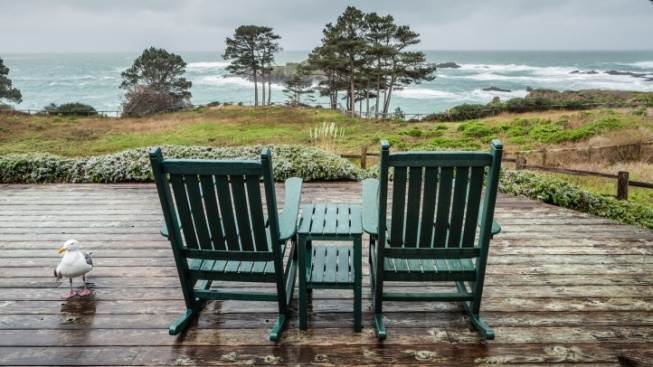 And while it doesn't own the patent on "tucking in," Little River Inn, that historic charmer of a stay-over spot on the Mendocino Coast, gets the concept thoroughly, and especially when the final sixth of the year has arrived. WHICH IT NOW HAS, and the tuck-in possibilities are plentiful at the inn. There are not one, not two, but a cozy-making quintet of seasonal specials on or just ahead, so picking how your tucking-in shall go is the next order of the day. Hankering for fab dishes made with local fungi? You'll want to secure the inn's Mushroom Mania rate before Nov. 11, when Feast Mendocino! wraps. Looking to take a break from the hubbub between the Sunday after Thanksgiving and the Thursday before Christmas? There's a Winter Special for that, oh yeah. OTHER SPECIALS... at Little River Inn include getaways that are blithely tied to the Festival of Lights at Mendocino Coast Botanical Gardens and the beloved Skunk Train's Magical Christmas Train. Also? There's a Storm Watcher Special, which brings a cloudburst of savings, too. How to pick? Tuck in under a favorite throw or blanket now while you peacefully peruse the inn's site and everything to come during its festive but unhurried, relax-focused holiday season.